I just realized I never shared this one last project from the Cloffice! 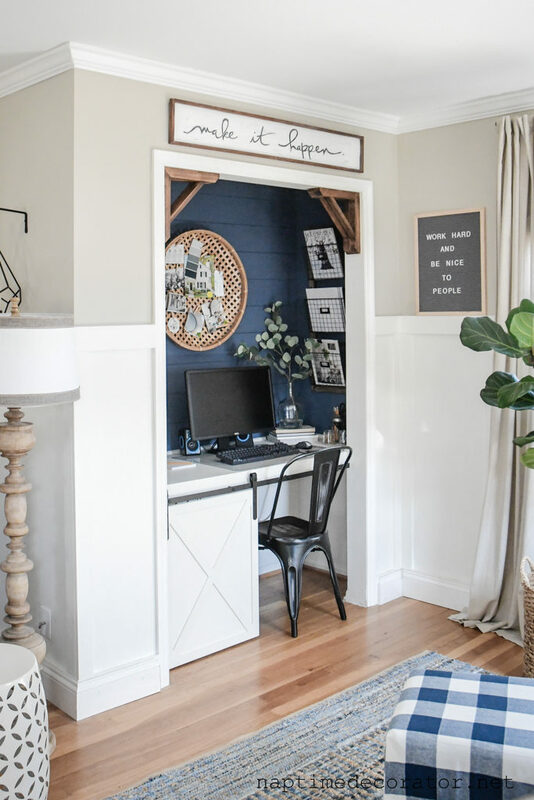 I tried to hit them all – first, came the reveal, then the DIY shelves, then the DIY custom desk with the mini sliding barn door…but totally forgot about the sign I made to hang above the space! 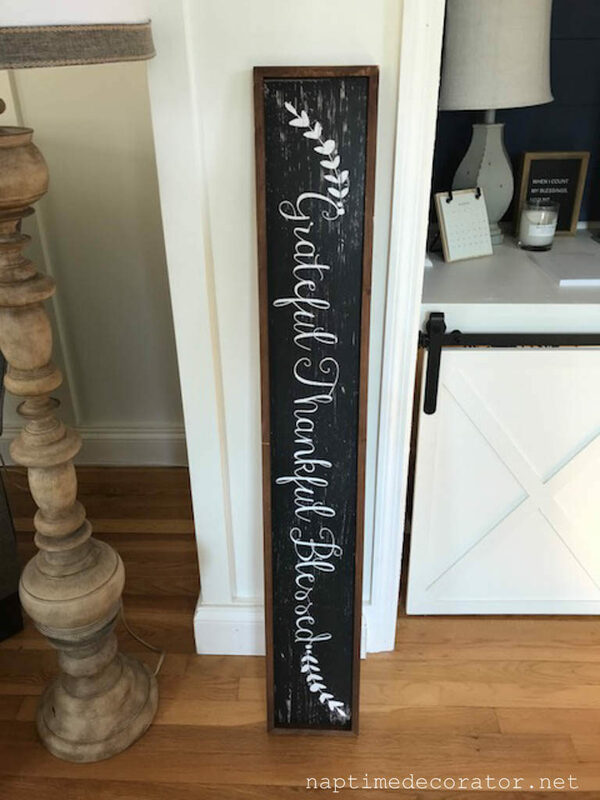 It all started when I spotted this perfectly sized rectangular sign at where else: Hobby Lobby! 😉 The size was just so so perfect, but it wasn’t the wording I was looking for above our home office. Went over the black with plain ol’ craft paint in matte white. I used a foam brush, and did a couple coats, until it was pretty much covered. I didn’t tape the wood frame, I was just extra careful as I approached the border. I thought and thought and thought some more about what saying I wanted to write. I wanted it to be inspirational, kinda go get ’em feel. (I actually thought about that one, but it didn’t seem visually long enough). 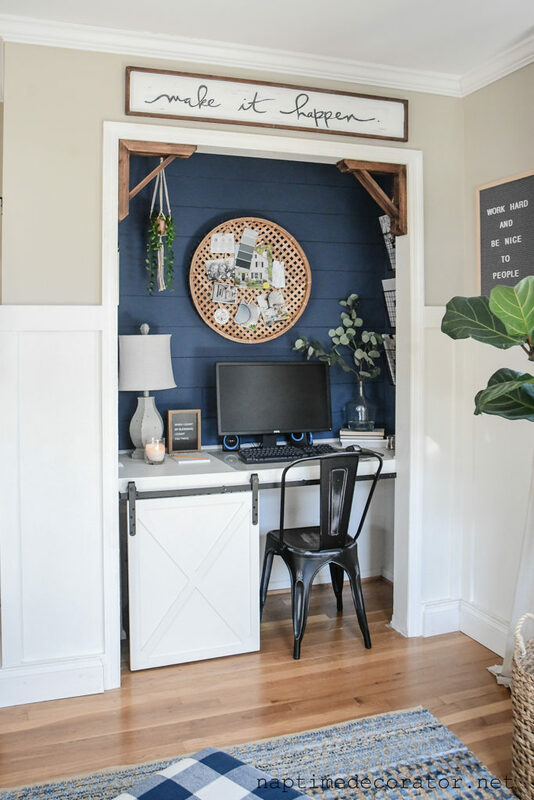 Since this is our office, where a lot of the magic happens, I wanted it to motivate, and light a spark within us when we come over here and sit down to work. I scribbled a bunch of different quotes, and in the end, ‘make it happen’ seemed just right. I took a pencil and lightly wrote it on the dried white paint. I went over it with a sharpie, then a small brush and some black matte craft paint. I decided to go over it with some light sandpaper to give it a distressed look. And done! All you do is stick it under whatever you want to copy, and go over it with a pencil and the image will transfer onto the wood! Then go over it with black paint (or sharpie first if you like). 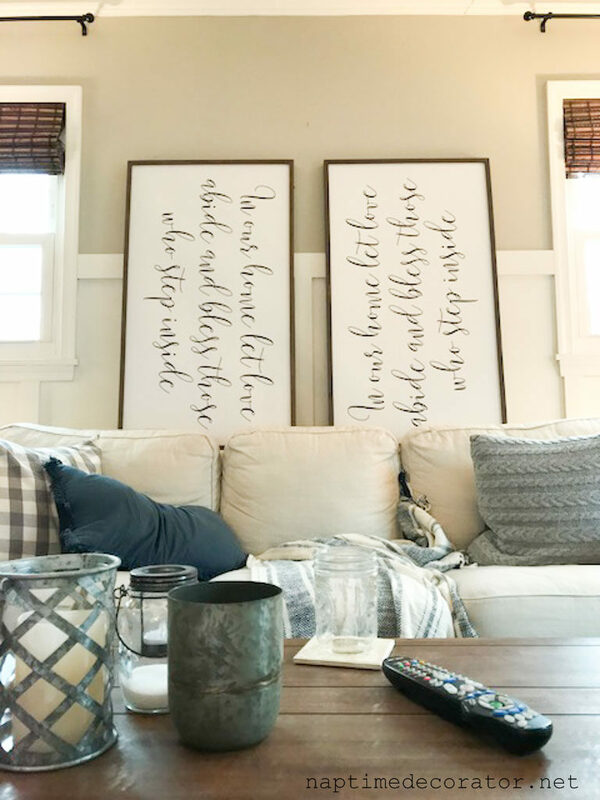 Sometimes it’s fun to create a sign from scratch, and sometimes time is of the essence and when you see a sign at a great price, but not the words you were looking for, it’s fun to go ahead and make it your own! 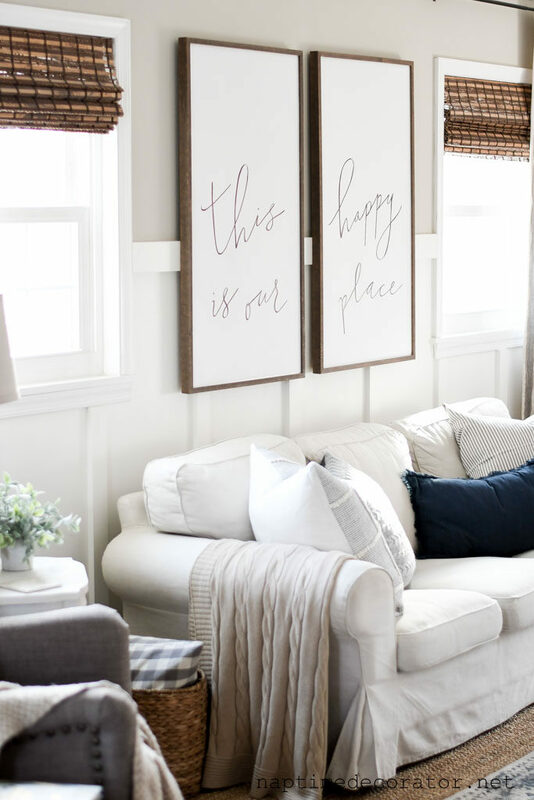 Remember this post, when I did a similar idea with the big signs over my couch? You are so talented. I love everything you do. 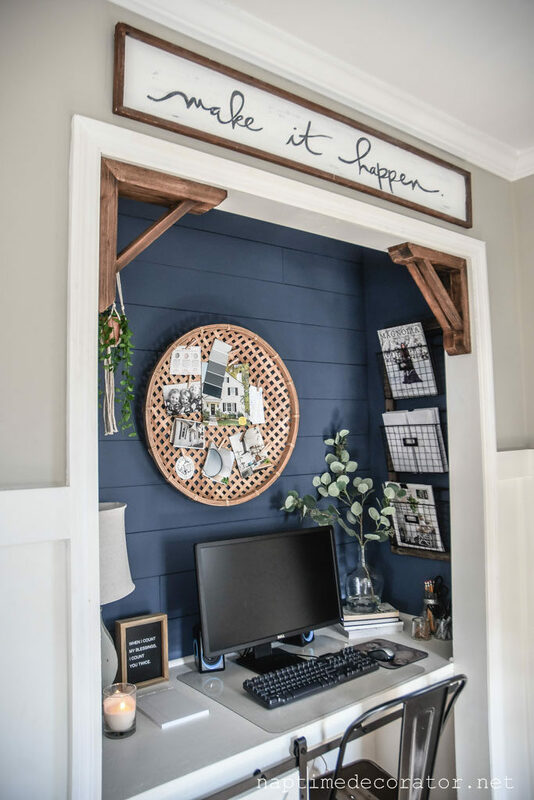 Where did you find the cute round basket you have hanging in the Cloffice that you are using as a vision board? Cute idea! Thank you so much, Sarah! What a nice thing to say:) That’s from the Hearth and Hand line at Target!